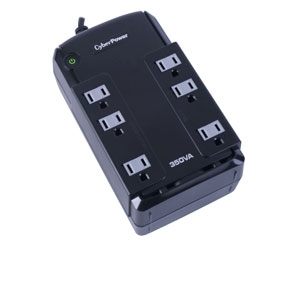 The CyberPower CP350SLG 350VA Standby Series UPS safeguards PCs with non-Active PFC power supplies and other electronics (monitors, cable DSL/ modems, VoIP routers, fax machines, and home theater equipment) from blackouts, brownouts, surges, spikes, sags, and other power abnormalities. 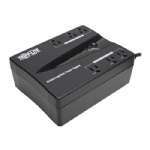 Its composite integrated circuitry offers advanced lightning protection. Patented GreenPower UPS� advanced circuitry reduces UPS energy costs by up to 75% compared to competitive models. The CyberPower CP350SLG 350VA Standby Series UPS has a capacity of 350VA / 255Watts, six NEMA 5-15R receptacles, including two widely-spaced outlets to accommodate transformer-based plugs. The CyberPower CP350SLG 350VA Standby Series UPS features a compact design that allows for horizontal or vertical placement. This CyberPower CP350SLG 350VA Standby Series UPS has a maintenance-free 12V/3.6Ah battery. Protection for phone/network (RJ11) is also included. EMI/RFI filters increase the immunity of the load to disturbances and surges. Purchase the CyberPower CP350SLG 350VA Standby Series UPS today! Energy-Saving Technology: Patented GreenPower UPS� advanced circuitry reduces UPS energy costs by up to 75% compared to competitive models. Ultra-Quiet Operation: One of the lowest sound emissions of any UPS in its class. EMI/RFI Filters: Shielding against electromagnetic interference and radio frequency signals prevents line noise ("humming") over telephone lines or audio systems. Transformer-Spaced Outlets: Widely-spaced outlets accommodate large transformer-based plugs without compromising the utility of other outlets. Convenient Mounting: Compact size for mounting horizontal or vertical. LED Indicators: LED status lights indicate Power-On and wiring faults. Audible Alarms: Distinctive tones identify when the unit is running on battery power, if it is overloaded or when the battery is low. Resettable Circuit Breaker: The user may use this convenient unit reset switch in case of an overload. Windows Compatibility: Our PowerPanel� power management software has been fully tested and is compatible with Windows 2000, 2003, XP 32/64, Vista 32/64, 7, and Server 2008.